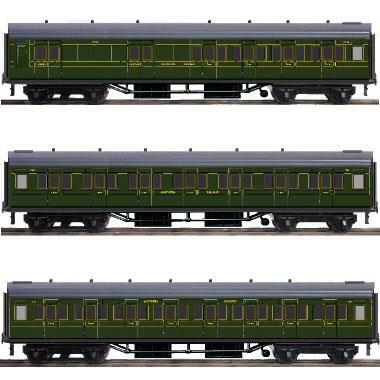 40cm coaches newly tooled with correct chassis design, lighting and interiors. Consists of 3 coaches Set 209 - Bke3rd 3722 , Corr1st 7411 and Corr3rd 1127 . Consists of 3 coaches Set 250 - Brake 3rd 2785 (With Working Light), Corr 1st 1884 and Open 3rd 1450 . Ace Trains O Gauge C/22 SR Maunsell olive green pre-war coach, Corr. Composite coach. No. 7674. Single Coach. 40cm coach newly tooled with correct chassis design, lighting and interiors. 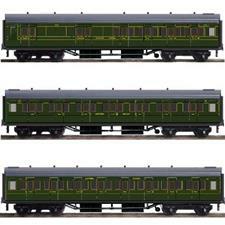 Ace Trains O Gauge C/22 SR Maunsell olive green pre-war coach, Dining Car No. 7866. Single Coach.